I know you know and this is old news. However, my post is about the negative comments and discussions on the net on why Zuckerberg doesn't deserve to be the Time's Person of the Year. I just wish they would just shut up. Most people love Facebook and that's the first thing they check on their PC, or Macs and now their mobile phones, when they wake up. If you don't like Facebook and worried about privacy, just close your account. In University, you are nobody if you don't have a Facebook account. If you don't, how are you going to know about the cool events happening and how are you going to discuss your group projects. Facebook's the place where we get back in touch with friends whom we went to nursery with and with old girlfriends who are now old with kids. I love Google and tried to support Orkut for a while but it was so boring and I haven't closed it only because I still have so many Indian friends on it. Google has tried to update it but I guess it's too late and many of my Indian friends are jumping ship every day. The question everyone asks now is "Why is Facebook so successful?" I think the answer is quite simple - it has something for everyone. Something for narcissistic people who love to post up pictures of themselves, people who want to get in touch with old sweethearts after a friend told them that he/she was on Facebook, proud parents who want to show off their kids, people who like to imagine themselves as farmers building immense virtual farms with alien cows and the Eiffel tower right in the middle of their farms... The list goes on. Talking about vitual farms, many people (at least some people I know) just got onto Facebook to play Farmville. I don't doubt that Farmville was one of the major reasons why Facebook got so popular. 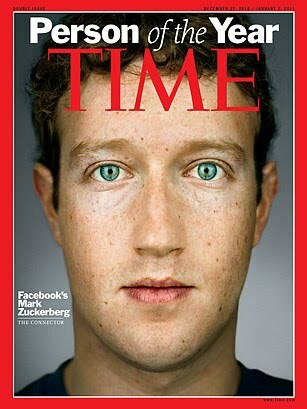 I believe that Zuckerberg does deserve to be the Person of the Year. There were so many social networks (OK! Not so many but a few) around a couple of years ago. Facebook came and just blew them away. It's the idea that everyone wonders why they didn't come up with. Some say they DID come up with the idea and Zuckerberg stole it but that's another story.